We have no idea if Aroldis Chapman can even come close to matching the hype created around his signing the last few days but he is definitely a player all fantasy baseball owners should have on their watch lists. If you are in a league with a mid-season farm draft or with very liberal rules for signing free agents, Chapman is worth speculating on. If the name sounds familiar it is likely the result of watching him in the World Baseball Classic, pitching for the Cuban team. He recently defected while playing in a tournament in the Netherlands with the intention of signing a large contract with an MLB team. Although his performance statistics were mediocre, he impressed many scouts with a fastball that hit triple digits on the radar gun. He also throws a promising change-up pitch. 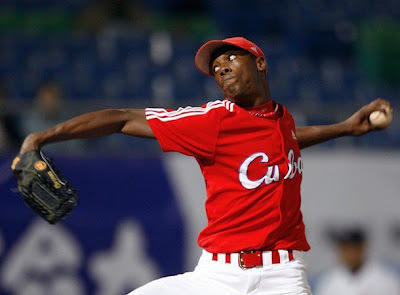 He has been compared to Jose Contreras another Cuban defector but he is younger and supposedly has the superior talent. If that's true you can expect the bidding to approach $50-60 million. But Chapman is still a raw talent. He will require a team with strong coaches and preferably a reputation for getting good results from raw talented arms. The Cardinals signed Dominican outfielder Wagner Mateo for $3.1 million. The Yankees signed Dominican catcher Gary Sanchez for $3 million as well as Dominican shortstop Damian Arredondo and Dominican righthander Christopher Cabrera for $400,000. The Athletics signed Venezuelan shortstop Wilfredo Solano, Junior Martinez, a Venezuelan third baseman, and Venezuelan Outfielder Alfredo Sosa. The Blue Jays signed Venezuelan catcher Santiago Nessy. The Brewers signed Dominican right fielder Jose Pena. The Astros signed Dominican shortstop Jonathan Mejia. The Pirates signed outfielder Ping-Hung Chi, righthander Shen-Cin Hong, and first baseman Chih-Wei Hsu all of Taiwan. Big John: I totally agree. He's a must-watch player. Check out http://mlbtopfantasyprospects.blogspot.com/2009/07/cuban-sensation-aroldis-chapman-defects.html to see my take plus some video from his first WBC appearance in Mexico City.